Pizza or chicken wings? Which are you in the mood for? Well, you can have both with our Low FODMAP Pizza Chicken Wings with Pepperoni. Or, you could leave the pepperoni out, but then you would miss out on that salty, porky lusciousness. As my husband declared, “no one will believe these are FODMAPian”! They are REALLY YUMMY! Chicken wings, both drums and flats, get coated with Garlic-Infused Oil, salt and pepper and are roasted until crispy. Then after you toss them with a simple tomato sauce they go back in a high heat oven sprinkled with shredded mozzarella cheese and pepperoni and roasted until hot and melty. A shower of fresh basil right before serving is way more than just a garnish! 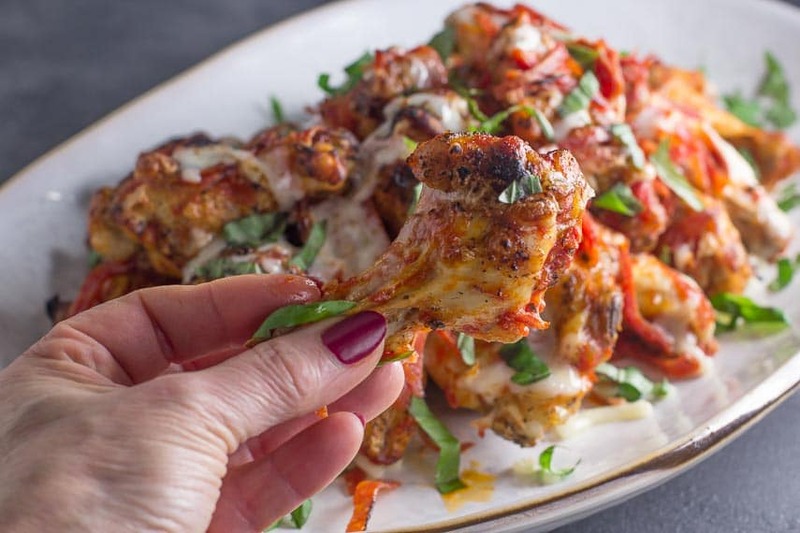 Don’t leave it out; it makes these Low FODMAP Pizza Chicken Wings sing! Is pepperoni low FODMAP? Yes, if it is free of high FODMAP ingredients and it IS possible to find it. Most pepperoni will contain pork and beef, many seasonings like paprika and chiles and additional ingredients. The proteins do not contain FODMAPs, so you don’t have to worry about those. Ditto for other common pepperoni ingredients such as salt, dextrose, lactic acid culture, oleoresin of paprika, citric acid and sodium nitrite. The term “spices” often appears. In the U.S. garlic and onion are NOT allowed to be hidden within this term. If you live outside the U.S. you should check with your country’s labeling policies. The term “natural flavorings” often appears. You must call the manufacturer and ask if any onion or garlic of any kind is used in their natural flavorings. You will not always get a straight answer, but it is worth a shot. Some labels with have the statement, “contains 2% or less” and then ingredients will follow. What is Magic About 2% or Less? Here’s the deal with ingredients listed on the label that are present in less than 2%: in clinical experience most RDNs have reported that this amount of ingredients typically will not trigger symptoms. YRMV. Know what that means? Your Results May Vary! So take heed. Fats do not contain FODMAPs, which are carbohydrates. Some folks with IBS react to fatty foods. This isn’t a FODMAP issue, but it is an IBS issue. 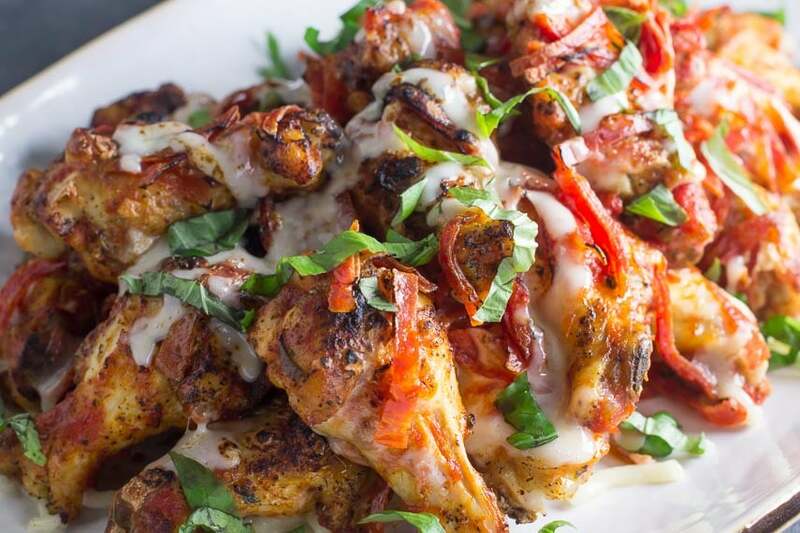 If you are sensitive to fat, go easy with your portions of these Pizza Chicken Wings. If you LOVE chicken wings, we’ve got plenty of low FODMAP recipes for you, such as a sticky maple/soy and ginger version, pesto, 5-spice, buffalo, maple Dijon chicken wings and more! 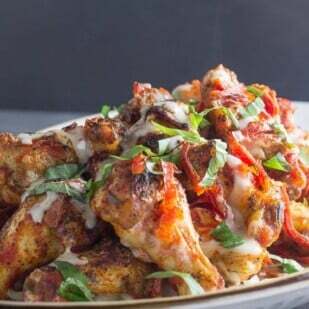 These Pizza Chicken Wings are perfect for big parties, like Super Bowl get-togethers! For more Super Bowl party ideas, be sure to check out our Super Bowl Roundup. 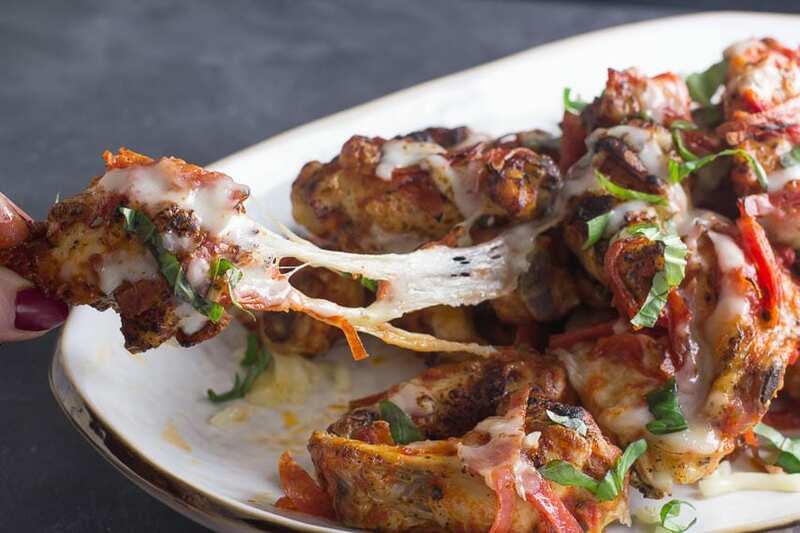 No need to choose between chicken wings and pizza when you can have our Low FODMAP Pizza Chicken Wings with Pepperoni! Perfect for Super Bowl parties or other get-togethers. Preheat oven to 450°F/230°C. Line a large rimmed sheet pan with aluminum foil or parchment paper, then place a rack on the foil. Place wings in a mixing bowl and rub down with the olive oil to coat thoroughly, then season well with salt and pepper. Place wings on rack, evenly spaced. Roast for about 35 to 45 minutes or until wings are just cooked through and register 160°F/71°C with an instant read thermometer. Get them nice and crispy. While wings are roasting, whisk together the tomato sauce, tomato paste and oregano in a non-reactive bowl. When wings are cooked through, remove from oven and toss with the sauce in the bowl. Place wings back on rack. Sprinkle with mozzarella and the pieces of pepperoni. Return to the oven and roast for a few more minutes or until the cheese is bubbly and melted. 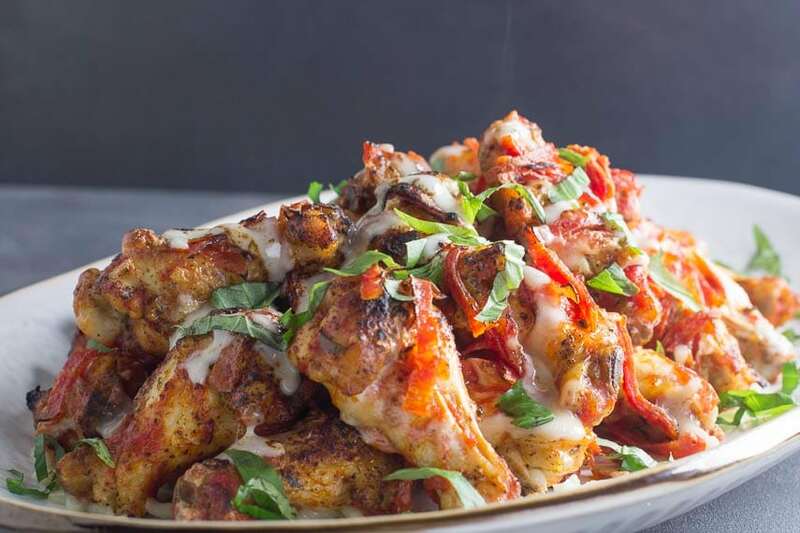 Remove from oven, pile wings on a platter, scatter fresh basil over all and serve immediately. The wings are good at room temperature too, but there is nothing as yummy as when they are hot, and all the salty, porky pepperoni juices are intermingling with the gooey cheese…you will see what I mean!